Celebrate PRIDE with Patience & Sarah at THE CENTER! Join us for OPEN BAR and MUSIC in the newly renovated Lerner Auditorium at the Lesbian, Gay, Bisexual & Transgender Community Center. Featuring Nadia Petrella as Patience, Elsa Quéron as Sarah and Michael Kelly as Parson Peel. Directed by Douglas Moser, Costumes and Set Design by Marie Anne Chiment, in a new seven-piece orchestration for Paula Kimper Ensemble. The opera is closely based on Isabel Miller’s 1969 novel, which in turn was inspired by the true story of two 19th-century women, the painter Mary Ann Willson and her companion Miss Brundage. 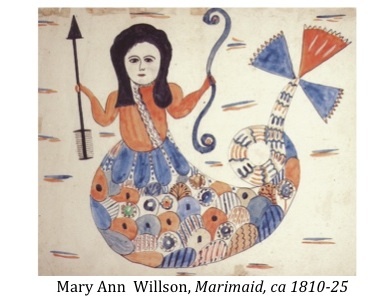 Today Mary Ann Willson is recognized as an outstanding primitive artist; her paintings may be seen in the National Gallery of Art in Washington, D.C. and the Museum of Fine Arts in Boston, Massachusetts. In the coming year we will be fundraising, and friend-raising, with the goal of producing the entire opera in June 2016, the 200th anniversary of when Mary Ann Willson and Miss Brundage went pioneering together in 1816.